Included in the Kindergarten Kit. This Manual is designed to each children to develop oral and written language skills as well as to read, spell and write. 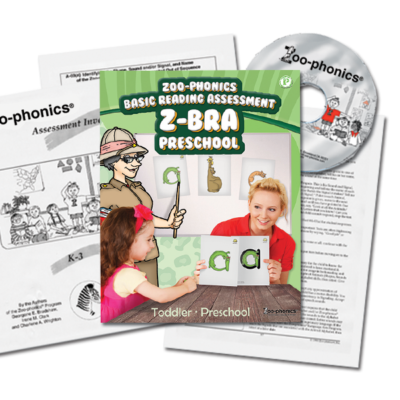 Zoo-phonics® starts with the recognition and mastery of the alphabet (lower and uppercase and letter sounds), phonics awareness activities, sound blending skills, reading and spelling of VC/CVC, high frequency, blend, schwa, digraph and long vowel words. Children will be reading, spelling and writing by January! Included are many black line masters for fun reinforcement activities, including “home-play” activities. Decodable text, as well as a selected varied genre of literature, is integrated into the lesson plans. Broken into Monday – Friday lessons. Includes state standards for each lesson. The Adventuresome Kids Manual on CD is also included which integrates art, math, music, science, drama, physical education, social studies, cooking/nutrition, etc., all taught phonemically. *All materials included on CD and DVD-ROM disks are produced in Adobe Acrobat PDF format. Acrobat Reader for PC and Macintosh included.